How much traffic is your blog receiving daily? 1.) Is still new and as such it has no traffic. 2.) Your blog has been around for quite a long period of time and as such it already has traffic. It doesn’t matter whether your blog has traffic or not, you have to keep on using the techniques that drive more traffic to your blog. There are techniques that work for a blog that has got no traffic. There are techniques that work for a blog that has got traffic. As an example, you can use opt-in email advertising if your blog has got traffic. But you can’t use this technique if your blog has got no traffic. It’s common sense that you can’t build an emailing list if hardly anyone is visiting your blog. One of the techniques you can use to get more than 1000 visitors per day is publishing videos on YouTube. This technique works regardless whether your blog has got traffic or not. You’re going to learn 12 YouTube Video Tactics that will get you more traffic. Let me be frank to you, it is quite difficult to drive traffic to your blog using YouTube videos. Because videos don’t work effectively for all content. Don’t create a video whose content no one is interested to view on YouTube. You should know the type of content people want to view on YouTube so that you create videos that will receive many views, get you many subscribers and click-throughs to your blog. So, what makes YouTube website to be a good source of traffic for your blog? For me to answer this question, let me highlight important facts that have already been reported online about this video-sharing website. To start with, there are over a billion YouTube users. That is almost a third of all people using the internet. It’s the most popular video-sharing website in the world. As of June 2015, YouTube was listed as the third most visited website in the world. It attracts each month more than 15 billion visitors. It was reported in 2014 that, “More than 300 hours of video were uploaded to YouTube every minute.” Compared to 2013, video uploaded to YouTube during 2014 increased by 100 hours per minute. There is a 60% increase in the number of hours being spent by people on YouTube watching videos. According to Google, it is the fastest growth seen in two years. There is 40% increase in people watching Videos on YouTube every day since March 2014. YouTube views from other countries apart from U.S are 80%. More than half traffic of YouTube is from mobile devices. This website is accessed on mobile by people aged 18-34 and 18-49. It’s reported that the number hours spent watching YouTube videos on mobile has increased by hundred percent. YouTube is available in 76 different languages. This covers 95% of the population in the internet. According to statistics on YouTube Press, there is 50% increase in the number of YouTube Channels that are earning six figures each year. As of October 2014, rightsholders who had chosen to monetize claims were paid out $1 billion by YouTube. The following are 12 effective ways you can use to get more traffic to your blog. They’re practical ways you can easily apply to drive traffic to your blog. Use these 12 practical ways to leverage the potential of YouTube for your blog. You want to optimize your blog in the search engines. You also want your blog to have a public presence on YouTube, right? For you to make this happen, you have to create a YouTube Channel for your blog. First, you should create an account with Google if you haven’t created one. Once you have an account with Google, you should log in to your account for you to be able to create a YouTube Channel. Below is an example of YouTube Channel. Since the channel name will be already linked to the name you used to create an account with Google, you should edit it. Edit it so that you use a name that will optimize your YouTube Channel in the search engines. Since you want to use YouTube Channel to target specific group of people, you should include the keyword that defines your blog when you’re creating the name of your YouTube Channel. Whenever people view your videos, the icon of your YouTube Channel is going to be shown right below your videos. The icon will also be displayed in the left-hand side of your YouTube Channel Art image (banner). The image you upload to be an icon for your YouTube Channel should be visible. The recommended size is 800 x 800. Let the logo of your blog be your icon image. By using it, people will associate your blog with the video you have published on YouTube. It helps you to gain exposure for your blog. The Channel Art is going to increase brand awareness for your blog by giving it a unique look and feel. You should upload the logo of your blog to be your YouTube Channel Art. The recommended size of image is 2560 x 1440. The maximum file size is 4 MB. 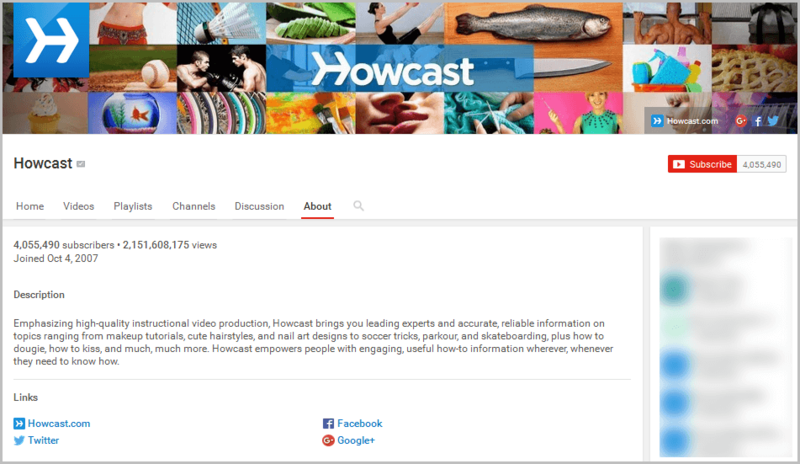 Note that your Channel Art may appear different in size on mobile, TV and desktop displays. Ensure that it is displayed well in different devices. You can also display a hyperlink to your blog in the right-hand side of your YouTube Channel Art image. The description is going to be displayed once people click the “About” link that will be shown on your YouTube Channel. The description you write is going to optimize your YouTube Channel. It is the one that is going to tell people what kind of content they expect to view. You should write a description that will create an interest in people to view your videos, subscribe your YouTube Channel and click-through to your blog. Note that part of your description is going to appear elsewhere on YouTube and it will also optimize your YouTube Channel in the search engines. Your description should have a call to action that links to your blog. From your description, you can also link to your social networking sites. Create an introduction video for your YouTube Channel. Let people know why they should watch your videos and subscribe to your YouTube Channel. It’s the introduction video that will make people to have an interest in viewing your content. Your introduction video should also make people to be aware that the YouTube Channel they’re viewing belongs to your blog. As such, it should invite people to visit your blog. One thing you should know is that optimizing your videos in the search engines is not the same way you optimize your plain text blog posts. The search engines bots can’t view your YouTube videos. But, they can crawl the text description of your video to determine on how to rank it for your target keyword. When you’re writing the description for your video, ensure that it’s long enough to give important information about what your video is all about. Use a keyword that will optimize your video in the search engines. For you to drive more traffic to your blog, you should include a link to your blog at the beginning of your description. You should link your YouTube videos to blog posts with relevant content. This way, you’ll increase your conversion rate. If for instance your video is about how to create a video, link it to your blog post whose content is about creating a YouTube video. Don’t use keywords that are too competitive to rank your videos in the search engines. Using too competitive keywords to describe your videos will make it impossible for you to drive traffic to your blog. Before using the keyword you’ve selected, you should determine if there are video results appearing on the first search result page found by the search engines. Use a keyword tool to determine the competition of the keywords you want to use. You’re allowed to use 5-7 tags as keywords for your videos. The reason you should include tags is that they’re the ones that are going to associate your video with other relevant YouTube videos. Don’t just publish your video on YouTube and wait for people to find it. You should take your video to the right people it’s targeting to view it. The more views your video receives, the higher chances it has to be ranked well by the search engines. This also will increase click-throughs to your blog. This is the reason you should share your videos on the social networking sites. Encourage people to share your video on the social networking sites. One of the best ways to use YouTube to get more traffic to your blog is by using YouTube Adverts. In fact, this is the fastest way you can drive targeted traffic to your blog. Your advertisements are going to be displayed at the beginning of selected YouTube videos before the actual videos play. Short text advertisements having a link to your blog can also displayed in selected YouTube videos. I.) You’re in control of your budget. II.) You’ll only pay when someone engages with your advertisement. You won’t pay if someone skips your advertisement before 30 seconds. III.) You can target people by interests, gender, location and age. Use Google Adverts to drive more traffic to your blog. One of the ways to use YouTube to get more traffic to your blog is by embedding your videos within your emails. It has been proven that emails increase the conversion rate. This is a good reason you should embed your YouTube videos whenever you send emails to your readers. Don’t go crazy with annotations. They can be distracting to viewers if you overuse them. However, annotations can be a great way to give viewers a little more extra information to emphasize important points. With annotations, you’re able to layer text and add a link to your YouTube video so that you drive traffic to your blog. Use annotations sparingly, but do use them when it makes sense so that they help you to capture people’s attention and get more traffic to your blog. I.) Go to your YouTube Channel. Click the video you want to add annotations. On the right-hand side just below your video click Video Manager. II.) You’ll be directed to a page where you can edit your video. Click edit and from the drop-down menu that will be displayed you should click Annotations. III.) After you click Annotations, you’ll be directed to another page. On the right-hand side click the Add annotation button. IV.) 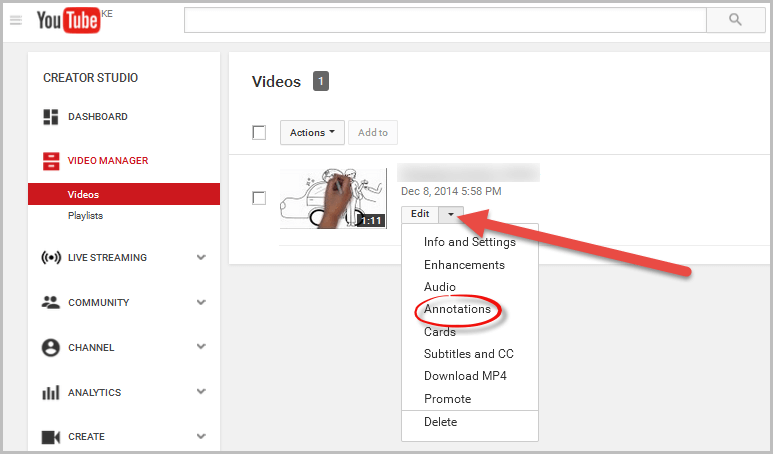 Once you’re done adding your annotation click Apply Changes. Once you publish videos on your YouTube Channel, you should organize them by creating a Playlist. A Playlist will also optimize your YouTube videos in the search engines. A Playlist that is keyword-rich is cable of driving more traffic to your YouTube videos. The more views your videos receive, the more traffic your blog will also receive. Transcriptions are a great SEO tool for your YouTube video since you’ll have the chance to use your keywords that will optimize your video. It also increases the number of people who share your videos. People will easily grab a quote from the transcripts of your videos that they will share online. Using YouTube to promote your blog is all about increasing visibility of your videos so that people share them on the social networking sites. You may just be surprised how much of a difference adding transcriptions to your YouTube videos can make this happen. Note that transcripts work effectively for videos that are less than an hour long. When you create a video and you know that the video has information that will help people to learn a new skill or the video is empowering people with engaging information on how-to do something, you should contact influential bloggers to request them to feature your video. When your video is featured on popular and influential blogs, it is likely to be featured by many other bloggers. As such, your video is likely to go viral. As a result, your traffic also increases. It should go without saying that you’ll want all of your YouTube videos to be engaging. One way that will make your videos to be engaging is by allowing viewers to post comments. Keep in mind that the search engines especially Google factors in the number of comments to rank YouTube videos. For sure, you’ll probably get some spambot comments. But you’ll also get the opportunity to engage viewers who may be interested in reading your blog. Your blog being an interactive marketing tool, allow people to post comments on videos that you publish on your blog’s YouTube Channel. You should never create a YouTube video that doesn’t have a call to action graphic. Again, don’t make a mistake of having the same call to action in all of your videos. In each video that you’ll be publishing on YouTube, you should always use a different call to action. I.) Subscribe your YouTube Channel. IV.) Post comments on your video. You’re the one who is in control of your words; therefore, create a call to action that converts. Most people place their call to action at the end of the video.